Jazzheads and classical music hounds found their ears in sonic heaven this year, usually within the walls of Campbell Hall, the Arlington, or the Lobero. 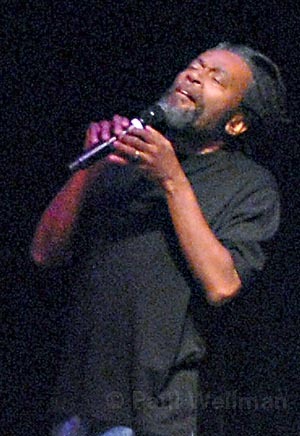 There was Bobby McFerrin, who brought a 12-voice choir to Campbell Hall and improvised for hours, often including a rapt and tuneful audience in the piece. LOOKING BACKWARD, LEANING FORWARD: A new year has landed, which means that the culture addicts among us are busy reeling in 2007, trying to make sense of what happened in the past 12 months. What seems like a knee-jerk tradition at year’s end, and a hopelessly subjective flaunting of opinion, may actually be one of the better means of keeping track of the dense and dizzy flow of time and culture. Herewith, more listmaniacal responses to a year gone down in history. BEST LIVE SHOWS IN SANTA BARBARA: Ingrid Fliter, Lobero; Hoenig-Pilc Project, SOhO; The Shins, Santa Barbara Bowl; John McLaughlin and the 4th Dimension, Lobero; Stevie Wonder, Bowl; Wilco, Bowl; Bright Eyes, with Gillian Welch, Arlington; Abigail Washburn and the Sparrow Quartet, SOhO; Pat Metheny and Brad Mehldau Quartet, Campbell Hall; Alfred Brendel, Lobero; Tyva Kyze, UCSB MultiCultural Center; Bobby McFerrin and Voicestra, Campbell Hall. SHOW OF THE WEEK: One of the more enchanted musical encounters in the long history of the Lobero Theatre came in 2004, when the always intriguing and poetic guitarist Bill Frisell landed there with a quartet including guitarist-steel player Greg Liesz, drummer Kenny Wolleson, and bassist David Piltch. Ambient alchemy filtered from the stage into the room. Frisell’s eagerly awaited return engagement at the Lobero comes on Saturday, when the genre-smooshing guitarist engages in a rare duet with his old pal, drummer Joey Baron. Baron and Frisell go back to the early days of Frisell’s strange and illustrious career in the ’80s, when Baron played in the guitarist’s band and both worked in the legendary avant-punk-jazz trenches of John Zorn’s Naked City. Some of us local oldsters remember first hearing Baron in Santa Barbara in the early ’80s at the old 1129 (where the Karpeles Manuscript Museum is now), playing straight-ahead jazz with Ira Sullivan and Red Rodney. Then, the mustachioed Baron bore his signature grin and big skill in swing mode. Little did we know how many modes he had access to. Frisell, meanwhile, continues to surprise and delight: His recent projects include a dynamic trio album on Nonesuch with inspired vets Ron Carter and Paul Motian, and another dazzling album with the lustrous, 25-year-old Motian trio featuring Frisell and saxist Joe Lovano. From Frisell’s left-of-jazz turf came last year’s hard-to-pigeonhole, seductively cool and grooving album Floratone (Blue Note) produced by and featuring drummer Matt Chamberlain (whom we just caught at the Arlington in one of his “day jobs,” with Tori Amos). NOT-TO-MISS JAZZ SHOW, PART TWO: So far, at least, the Monterey Jazz Festival 50th Anniversary project is less a coherent band than a loose joining of major talents on the occasion of this august festival’s golden anniversary last September. But their tour stop at UCSB’s Campbell Hall on Monday is a fine chance to hear some great jazz players in action-pianist/music director Benny Green, trumpeter Terence Blanchard, saxist James Moody, and vocalist Nnenna Freelon among them. TO-DOINGS: January turns out to be a hot month for serious music in town, thanks in part to the Percussion Festival being sponsored by the Santa Barbara Symphony, and incorporating numerous percussion-related shows around town. As a late-breaking kickoff, our old friend and worldly percussion master Airto Moreira, with his wife and partner Flora Purim, return to play SOhO on Saturday. Still to come, the great, vital veteran Roy Haynes brings his quartet to the Lobero on January 18, the same weekend the symphony features percussionist Colin Currie.